Nathaniel S. Wilson – Sailmaker « Hudson River Historic Boat Restoration and Sailing Society Inc.
Nat is a Master sailmaker, rigger and sail designer based in East Boothbay, Maine. He is most well known for building sails for large traditional sailing vessels in the United States and abroad. Nat is very excited about designing and building sails for Eleanor as sailboat Eleanor is being restored rather than being replicated. To build the sails for Eleanor, a historical vessel on the New York State and National Registers, is an honor and a privilege. We are pleased to have Nat Wilson and Suzanne Leahy, our spar builder, join in the restoration of Eleanor. Bliss has been working with Wilson since 2014 on the sail rig which includes, sails, spars, and rigging. 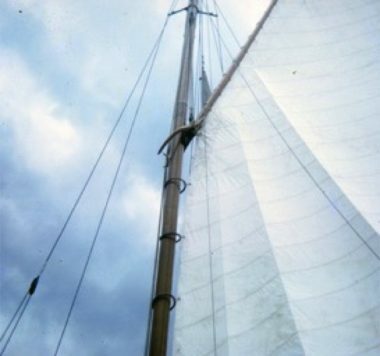 Much research was completed by Leahy, Wilson, and Bliss which has been very challenging as there are no plans in existence about the sail rig of Eleanor. Final details and planning are still to be completed and we must raise the funds to Raise the Sails. Ships that have sails and/or rigging built by Wilson include the U.S.S. Constitution, USC Eagle, Spirit of Massachusetts, American Eagle, and Mayflower 11.